At the Parsons Fashion Benefit last night, Marc Jacobs was in high spirits, as he will co-host Monday night's Costume Institute gala, with muse Kate Moss. When asked who will be seated at his table, he said, "It's going to be full of good friends, Madonna...Victoria Beckham, Anne Hathaway...Winona Ryder...Rachel Feinstein, John Currin...and Rihanna!" The downside of all this is that she will unlikely to be able to travel to Milan for David's birthday on Saturday 2 May. Well, it was back to Serie A at the weekend for the home match against Palermo. It was another great result at the San Siro for the team and our fourth win in a row. Confidence is high at the moment and we’ve hit a great run of form going in to the last few matches of the season. We know we’re still seven points behind Inter, but if they continue to drop points and we can keep winning, who knows what might happen? We’ve just got to keep concentrating on our own form and see where it takes us. We’ve overtaken Juve in the last few weeks and we going to do our best to finish as high up the table as possible, starting with next Sunday’s match against Catania. Finally some Victoria Beckham news. Victoria Beckham will be making a personal appearance for Emporio Armani, onn May 6, at the Macy’s Herald Square, New York. This PA is to unveil the newest Emporio Armani Underwear campaign for fall. This will be the second time Beckham is featured in the campaign, which was shot by Mert Alas and Marcus Piggott in a studio in Milan. Given that Beckham is in town next week, it is widely expected she will also attend the Costume Institute benefit on Monday. With her BFF Marc Jacobs co-hosting the night, it wouldn’t be surprising if she came as one of his dates. Lets keeps our fingers crossed for a double dose of VB out in New York. I'm starting believe the reason we have not seen her for a while, is that she is preparing to unveil a new look. I pray she returns to hair extensions. Taking inspiration from his fashion designer wife, David Beckham has added designer to his résumé. He collaborated with James Bond, owner of the Undefeated sneaker-freak boutiques, on a fall-winter men’s collection for Adidas Originals by Originals. Beckham frequents Undefeated in Los Angeles and someone at Adidas, aware of their mutual admiration, proposed they collaborate. Their design approach was to update classic American sportswear with fashionable silhouettes and details. The apparel range features materials such as leather, cashmere and silk, while the footwear builds on iconic Adidas styles. The duo also developed accessories and thermal layering pieces. However, Beckham, who already has an athletic endorsement relationship with Adidas, has no plans to use his image or personal appearances to promote the new line. I think it's quintessentially David, I can so picture him wearing this. AC Milan are up to second place in the Serie A table, seven points behind leaders and city rivals Inter, after a comfortable 3-0 home victory over 10-man Palermo on Sunday. Milan took a 10th-minute lead at the San Siro when Kaka scored from the penalty spot after Massimo Ambrosini had been fouled. The other 2 goals came from Inzaghi in the 20th minute, and Kaka scored a second after 57 minutes. David Beckham has been confirmed as Britain's richest athlete by the annual Sunday Times rich list, with a personal fortune estimated at £125 million. The list is due to be published by The Sunday Times newspaper this weekend. David's fortune is almost 40 per cent greater than retired heavyweight boxer Lennox Lewis, who is in second place. Former Ferrari driver Eddie Irvine stands in the third place on the list. The rich list is not limited to British citizens and includes those who either live or predominantly work in Britain. Has Victoria Beckham been picking up some style tips Michelle Obama? The First Lady wore this cropped Alaia cardigan and dress three weeks ago, when she visited Europe. Victoria also wore an Alaia dress and the exact same cardigan last weekend. As much as I love you Victoria, I adored Michelle's look, so she wins this for me. David Beckham started against the Hungarian All-Stars in Budapest on Wednesday in a friendly match. The Italian side trounced the Hungarian All-Stars team in friendly match held Wednesday. Kaka celebrated his 27th birthday with a goal. AC Milan showed off their soccer skills by thrashed the Hungarian All-Stars 5-2. Kaka, who was celebrating his 27th birthday, took the lead in the 38th minute, and assisted Ukranian Adriy Shevchenko to make it 2-1 in the 65th, nine minutes after Paks Attila Tokoli managed to equalize. Then, Shevchenko scored again and Clarence Seedorf made it 4-1. Uruguayan Tabare Viudez decorated a bit more the scoreline and scored the fifth goal form Milan, who fielded all their figures. With ten minutes remaining, Ronaldihno hit the crossbar off a penalty kick. David appeared to have a few heated exchanges in the match. 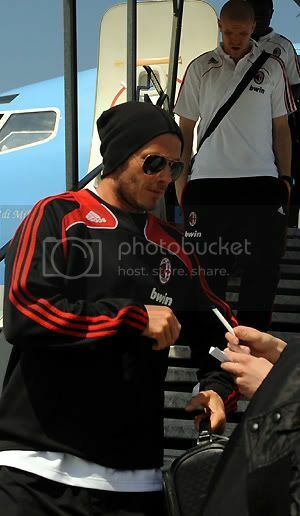 David Beckham landed in Budapest earlier today with his AC Milan team mates. The team are in the country to play a charity friendly against Hungarian League Team at the Puskás Stadium. Today is Kaka's birthday, so Happy Birthday to him. Thanks so much for the pictures Nikolett. It's not often I can bring you what's in David's closet, but thanks to dangio1985 I can. 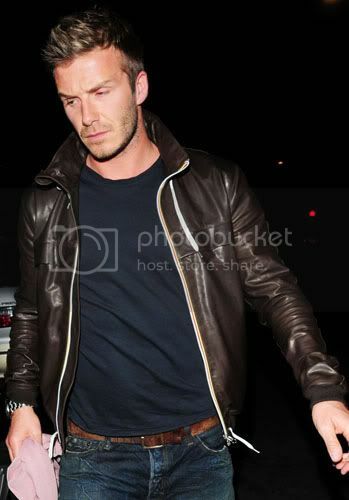 When David dined at Cipriani’s this week, along with his PRPS jeans and Lanvin sneakers, David was wearing a Gold Bunny leather jacket. 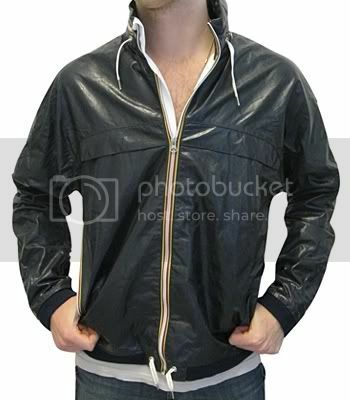 The leather jacket is exclusive to Kitson's, and is currently sold in 4 colours including black, green, yellow and white. Well, as you might already know, I spent Monday in London with Andy Murray and Denise Lewis helping to launch the charity Malaria No More, which I am proud to be part of the Leadership Council for. We had a really positive day, first at Wembley with Andy and then we met up with Denise and the Prime Minister at Downing Street. The fight against Malaria is something that I am really passionate about. I saw first-hand last year just how crucial these bed nets are. I went to Sierra Leone with UNICEF and saw families devastated by malaria and other diseases. There, one in four children die before their fifth birthday. I visited health clinics and learnt why people die so young. And sadly I saw that it’s mainly from preventable diseases such as malaria. These heartbreaking facts made me back the new charity Malaria No More UK. The fact is malaria is the biggest killer of children in the world, with a child dying every 30 seconds and there are around 250million cases of malaria worldwide. But what most people don’t realise is that malaria is preventable. These kids can be saved. Malaria No More UK wants to get bed nets to everyone in Africa who needs one by the end of 2010. It’s an ambitious goal — but it can be achieved if we all get behind it. I’ll never forget how fragile those children I met in Africa were and to know how fleeting some of their lives could be. For just £5 you can buy a mosquito net, which will protect a mother and child, or brother and sister, for up to five years. As a dad of three myself I want to do everything possible to help these kids. Here is a cute ad featuring David Beckham for Malaria No More campaign. David encourages you to donate a mosquito nets to protect African children from malaria. Malaria claims one child's life every 30 seconds. The comical bit comes at the end. sxyfashionqueen has identified Victoria Beckham's LBD. The dress is by Azzedine Alaia, and so is the black cropped cardigan. 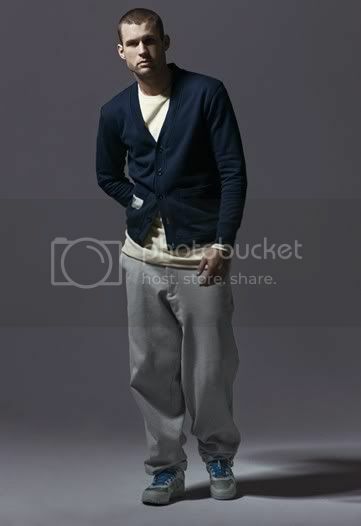 You can find the cardigan in white on Matches.com for £508. David Beckham was spotted leaving Cipriani’s restaurant in Mayfair just hours after visiting Downing Street to launch a new drive against malaria. He was dressed in a brown leather Gold Bunny jacket, PRPS jeans, Lanvin trainers and a pink scarf, looked serious as he exited the exclusive eatery last night. Love the pink scarf. Only David can pull a pink scarf off and still look manly. A very handsome David Beckham was part of a celebrity team of sports stars to be at No. 10 Downing Street to help launch an international anti-malaria campaign. 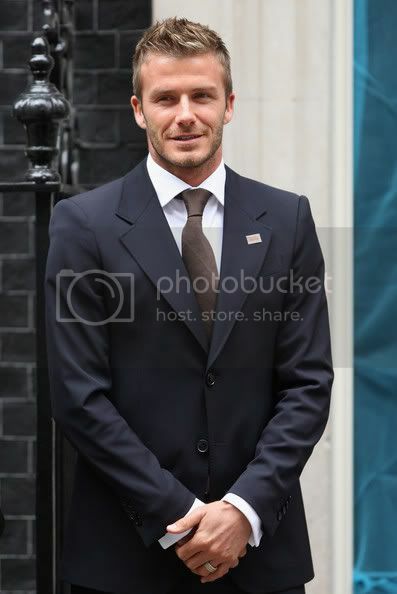 David joined tennis ace Andy Murray and Olympic gold medalist Denise Lewis on a trip to see Prime Minister Gordon Brown at the London event. "It's truly incredible to think we can stop this killer disease forever and it's such a simple thing to do," said Beckham. "For less than a cost of a football you can protect a family from dying." I love that he is always willing to put his support behind worthy charities. NEVER leave David Beckham on the bench, as he is vitally important for EVERY game. David proved that tonight by producing display of pure brilliance, as AC Milan moved up to second in Serie A with a 5-1 win over Torino. David started the match after two games as an unused substitute after an apparent "shoulder injury", and set up the first two goals of a Filippo Inzaghi's hat-trick. Beckham first found Inzaghi after nine minutes from a free-kick, but the Milan striker had strayed offside, and the goal was ruled out. Four minutes later the Inzahgi scored from a Beckham corner and on 37 minutes a clever chip into the box from David again found Inzaghi head's to make it 2-0. After spending two games on the bench, David Beckham WILL start for AC Milan today against Torino. Here is the line up. MILAN : Dida; Flamini, Senderos, Maldini, Zambrotta; Beckham, Pirlo, Ambrosini; Kakà; Pato, Inzaghi. TORINO: Sereni; Rivalta, Natali, Franceschini, Rubin; Abate, Dzemaili, Barone, Diana; Rosina; Bianchi. Before I wrote the previous post about Victoria Beckham's new baby blue Birkin, I looked at her World Cup blue Birkin, and confident that they were not the same. A few of you have wondered the same - is this a new Birkin? I then wondered could the light be distorting the colour of the bag, but I'm confident it's a new bag, as it's much lighter in colour. Thanks to Sxy Fashion Queen for the old school pictures. Still missing those gorgeous long locks. UPDATE: Apparently this is a birthday present from David. Ahhhhh bless him. Can I have in for my Birthday Becks? Victoria Beckham was spotted out shopping at The Grove in LA on Saturday afternoon, with her sons, sister, and niece Liberty. The Beckham gang grabbed up a bite to eat at La Piazza restaurant, before going to Bed, Bath and Beyond and a few of the popular boutique shops. Looking back on Victoria's vast Hermes collection, I would guess that she has a new Hermes Birkin. The bag is gorgeous, which she uses to carry Cruz' Wolverine toy. She wore a black sleeveless Azzedine Alaia dress, with a black cropped cardigan by same designer, with black Louboutin booties. Too much black for a sunny Saturday afternoon.